I have not been doing much baking lately. Although I update my blog regularly, the last 5 posts have got nothing to do with my oven (^_^"). I used to bake bread at least once a week, but ever since my bread machine broke down, I got lazy. Even the thought of baking a chiffon cake seems like a tall order. So, whenever I craved for some baking activities, I turn to simple cakes and muffins recipes. 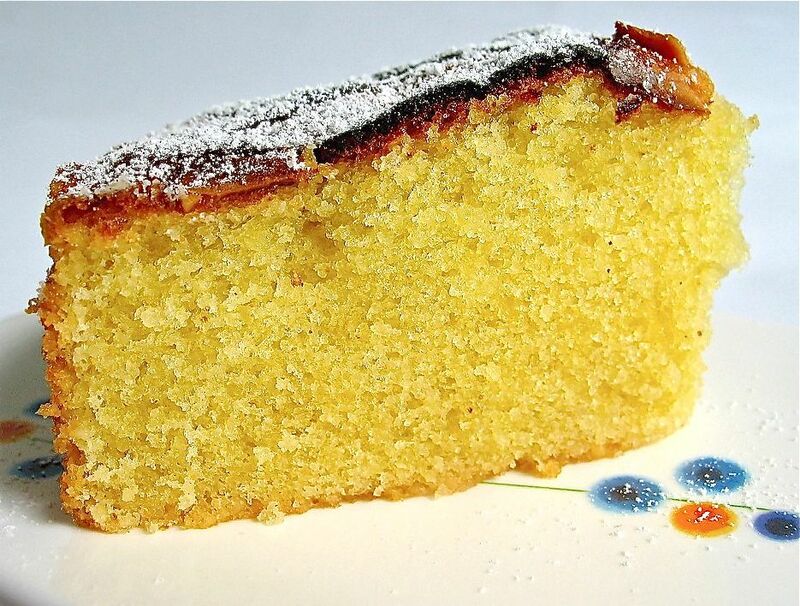 One great example of a super simple bake is this French Almond Cake. It is taken from this book "Easy Cake" by Linda Collister. I love all her books! I find her recipes easy, straight forward and very doable. You will be surprised at how easy to prepare the batter...the ingredients are all mixed together in a mixing bowl, all at the same time. It takes less than 5 mins for me to get it mixed and transferred to the baking pan, so it is a must to turn on the oven before you start gathering the ingredients. Even though it is such an easy, almost fool-proof cake, I made a big blunder when I first baked it. I had made a serious mistake of leaving the cake in the oven, and, not returning to check on it until I spotted a slight burning smell coming from my kitchen. Even though it was only half-way through the baking time, the top was almost burnt. It was too late to do anything, the only thing I could do was to tent the top with a foil and left it to finishing up baking. This was baked using a 20cm pan as recommended by the recipe, the cake was quite flat upon cooling, making it looked almost like a sponge layer. The cake was nicely browned this time as I covered the top with foil once the surface started to brown. The cake is excellent, it is deliciously moist, very fragrant and I could even taste the bits of ground almond in the crumb. The flaked almonds makes the texture even more interesting. A piece of this goes so well with a cup of afternoon tea, or anytime of the day. Plus, I won't be hesitant to bake this to give away anytime. Pre-heat oven at 180degC. Grease (with butter) and flour the sides of a 20cm pan, line the base with parchment paper, set aside. Place butter, sugar and eggs in a mixing bowl, add almond powder, flour, milk, vanilla extract (optional) then beat with an electric mixer or whisk. When quite light and fluffy, spoon into the prepared pan and spread the batter evenly. Sprinkle the flaked almonds over the top. Run a thin bladed knife around the sides of the pan to loosen the cake, then turn out onto a wire rack and let cool. Dust with icing sugar before serving. apart from it being burnt, I think the cake sounds very convincing. I would really like to make this! Sounds delicious. I love nuts. It must have a very nutty flavour! This cake must have full of almond taste. I like any bakes that goes with almond. It gives a rich texture for the cake. I like your bakes!! Oh please bake one to give away... to ME!!!! 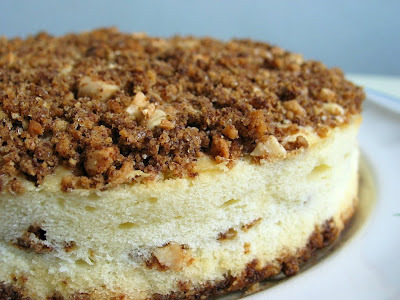 I have never try a cake with almond, must find one day to try this. Thanks for sharing. The texture of the cake looks superb! It's a must try, this one. I have Linda Collister's brownie book and I agree that her recipes can't go wrong. Hi Octopusmum, most websites (eg here: http://www.joyofbaking.com/eggs.html) state that a large egg is 57g with shell on. I use eggs that are about 60g with shell. Those that are 70g are considered super large eggs. Hope this helps. I tried this out and the cake turned out slightly underbaked and also a little dense. I baked it for 40 mins and the skewer came out clean so I thought it should be done. Nevertheless, it taste great as you mentioned. I actually changed the flaked almond to chopped walnut and i just love the nutty taste. I will sure bake this again as this is so easy yet yummy yummy delicious. A perfect accompaniment for afternoon tea - if it's true that we eat with our eyes, then this has to be delicious. Hi HHB, may I know where do you get ground almond? Do you grind it yourself? There was once I got those ready ground almond and found it was not fresh. It had no almond fragrant at all, even though it self life was half a year before expiry date. In the end, I discarded that packet together with an almond cake that I had baked! Hi Wong, what a pity that the cake didn't turn out as expected :( Are you able to identify the cause of it? Did you check your oven temperature? If is is undercooked, it could be the temperature was too high when you put in the cake. May I ask what kind of skewer are you using? I read that a metal skewer will come out clean even though the cake is undercooked. Hi Sue, I got the ground almond from Phoon Huat. I will try to use it asap and any leftovers I will store it in the fridge. I will also toast it before use, (toast almond powder at 100 degC for 10 mins. Stirring in between. Let cool before use.) The flavour of the almond powder intensifies when toasted. The sponge looks soft and moist. Yumm!! I love almond and I think this almond cake still looks pretty with a little burnt on it. so i am using large eggs all this while! thks for the explanation. hi HHB, I remember that you used to have an earl gray chiffon cake recipe, so was trying to find that recipe. Just realise I can't find it in the recipe index / easy as cake. Other than not very appetizing, the cake was acuatlly soft, moist and taste great. Do you mean I should pre-heat my oven with lower temp then half way thru the baking process, increase the temp? Ya, I am using the metal skewer. So, a thin satay stick will be better? I baked this cake today and the output was somewhat Wong mentioned above, dense and did not rise much. The taste was good though. With the eggs mixed together with butter and sugar at the same time, the butter seemed a little difficult to blend well. So, I suspect this could be the cause of the non rising. What do you think ? And thanks for the recipe. Hi Sushi, pls go to the My Recipe Index link either on the top(just below the banner) or at the side bar. Look under Easy as Cake. My recipes got so long, so I had to re-do the entire Recipe Index. Hi Wong, so the cake has got uncooked batter?? No, I did mean to preheat the oven at a lower temperature, just preheat to 180degC will do. I use a toothpick to do the doneness test, I just heard from a friend that a cooking teacher told her that some cakes, the doneness test may not be reliable...skewer may come out clean because it got 'cleaned' on the way out of the cake, you know what I mean?? So actually this recipe actually recommends that bake the cake till "until the sponge just springs back when pressed". I didn't do this test as I am so scared of getting burnt! I didn't have problem with mixing the butter as I cut it into small cubes. The cake didn't rise much as it is suppose to be quite a flat cake. I will try this recipe again soon, and hopefully I am able to find out what could have gone wrong. There was no uncooked batter, just dense. In fact the whole process went on smoothly. I did have the same doubt as Melanie at first, whether ok to mix everything together. Anyway, I just followed the recipe step by step and I found my batter turned out light & flufy. Guess I should have baked it a little longer. May be another 5-10 mins. When I touched the surface a little (mine rough hand can stand the heat. ha ha! ), it was pretty soft and in fact looked "beautiful" with the walnut chunk on top. So with the skewer turned out clean, i just removed the cake out from the over. Forgot to mentioned, the cake surface got few big cracks..I did cover the surface with foil when it left with about 20 mins. So beside bake a bit longer, may be i will start to cover it a bit earlier too. I will try again as I still have the ground almond. Got to use it up before expired and most important is, my 2 girls + me just love the taste of this cake. 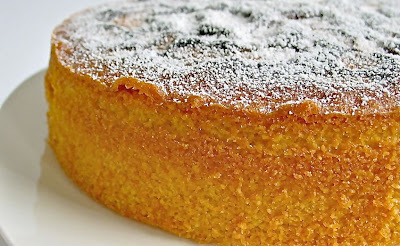 I've seen many recipes for almond meal-based cakes, French ones to exact. Thanks for sharing and reminding me! Been distracted ... Though it only involves usual ingredients, I'm pretty sure the taste was out of this world! I didn't have problem with cracks on this cake...I really think it is the problem of the oven temperature...suspect it is too hot...because if the temp is too hot, the cake will tend to peak and then crack. The edges of the cake bake and set faster than the middle. The middle then has more time to rise from the leaveners (baking powder) before setting, causing a peak. The other thing is, did you use an 8" pan? A smaller pan may take a longer time to bake, and the cake will tend to dome. And, the type of pan oso matters, eg a non-grease type (dark coloured) will tend to absorb heat faster, causing the sides to get cooked faster than the centre. I use those tin (silver) pans from Phoon Huat. If all else fail, you can always junk this recipe ;D I have no luck with those French yoghurt cake too, no matter what I tried, I just couldnt get it right, it is always very kueh-like! Anyway, I just tried another cake, I think you will like it, will post up the recipe, hopefully, by end next week. HHB,i baked this cake n it turned out deliciously moist n fragrant :) Will definitely bake it again cos its easy n yummy, thks for sharing. HHB, do you just put all the ingredients in mixing bowl and just whisk? Since i read the earlier comments abt the cake turning dense, i bake my cake by beating the butter/sugar (i use 100g sugar only) first. Then add 1 egg at a time and beat well before adding the rest of ingredients. The cake turns out beautifully with no cracks. what are ground almonds(almond powder)? ground almonds seem like whole almonds, whereas almond powder is in powder form? there seems to be a big contrast between the two? This looks delicious. I'm definitely going to put it on my list of things to bake soon. I just discovered your blog and I'm really enjoying your recipes. Thanks! Hi Anonymous, ground almonds is not whole almonds. 'Ground almonds' is the term for 'grounding' whole blanched almonds (without the brown skin) to powder form. However, over this part of the world, we are more familiar with the term 'almond powder'. So ground almonds is the same as almond powder. How do we cover/tent with foil? I see this term many times, but am not sure what that means or exactly how to do it. I also notice that you mention abt 15-20 min into baking. Can we do it at the first place before putting into oven? Hi Sushi, to cover the top of the cake means, using a sheet of aluminium foil (large enough to cover the entire surface of the cake) and place it over the top of the cake. You do not need to remove the cake from the oven, just open the oven and place the foil over the cake. The purpose is to prevent the cake surface from over browning, you don't do it right at the start as you need the cake to be probably cooked. Otherwise, the cake will take a much longer time to finish baking or it may be undercooked. The crumbs look fantastic! tight, moist and oh-so-yummeh!! Hi May, I guess we sort of found out the problem reader Wong encountered...she left a comment in my other post that she had cut down a lot on the sugar amount. That could be a possible cause for cake to turn out dense. I used walnuts instead of almonds, cos the only almonds I found at home were my Mum's 南杏北杏. The walnuts I used were large so I broke them into small pieces and subsequently mixed them in brown sugar (1 tablespoon). Instead of mixing everything together I separated the egg whites from the yolks, and whipped the egg whites first before mixing them in. Well, everything turned out quite nice, with a nice slightly crispy top. my cake is just out of the oven and i am waiting for it to cool down right now! the smell was wonderfully when it was baking in the oven. But, my cake is really short, it looks like it didn't rise at all. is it supposed to be this short? just had it for breakfast. It sure wasn't dense, in fact, it was moist and yummy. thks for sharing the recipe. Stumbled upon your blog and am very inspired! :) lovely bakes! About ground almonds- i have almond powder from Taiwan. It is for making almond drinks. Can i use that instead? It is finer than the ground almonds i see at Phoon Huat. It has a much stronger almond smell too. Hi JC, I am sorry I am not able to comment on this as I do not know the type of the almond powder you bought, as there could be other ingredients added to it, it may affect the outcome of the cake. I tried this recipe with the almond powder from Taiwan last week. The powder is 100% pure almond, just that it is ground very very very fine. The cake turned out very moist (but cooked!) as i suppose the almond powder melted into the batter. It was a buttery slice of almond cake! Just now, i baked this again, this time with a little bit more flour (45g) and about 10g of finely chopped almonds (i just chopped some of the flaked almonds for the topping) and baked for about an hour, with the last 15 minutes at 160 deg. It turned out more cake-like, but still very moist and fragrant. Hi HHB, for the flaked almonds, do we need to toast as well? Hi Hanushi, no, don't toast the flaked almonds, otherwise it will brown too quickly during baking. Hi HHB, ooo... thanks for telling me!!! btw, just wanted to let you know that this recipe is not on the cake recipes index, i just happen to chance upon it from another post, so i thought it'll be good to add it to the index else some people might miss out on this wonderful recipe :D just a thought. Thanks for pointing it out, I must have forgotten to add it in the cake recipe index, will do so! Made this yesterday and will make it again tonight for a dinner party. It is simply delicious. So simple, yet so tasty. Followed your advice (120g sugar only) and put more almonds in. Worked like a charm! I just wanted to say how very grateful I am for your incredible baking and dedication to this blog :) I baked this almond cake yesterday to take to a ladies' after-dinner tea and it was properly wolfed down! Thank you so much for a delicious, easy recipe! hi, i tried baking this recipe French almond cake today, but i made an error, I put 4 eggs instead of 3 that's why it taste eggy, and one more thing is it is oily but I put the same amount of butter. Is it natural? But I what i see in your photo it looks perfect. what must be the problem aside from I put extra egg? Tried this this evening here in Rotterdam, The Netherlands. It worked out a treat, exactly the same as the unburnt photo's. I didn't use the all-in-one recipe. Instead went classic, beating sugar & butter first then added the eggs one at a time. Finally added the almonds, flour, vanilla extract, milk. Great almond taste and devlishly moist. Hi Richard, thanks for sharing your experience, I am sure your method yields a fluffy and tender cake! Thanks for this wonderful no fuss / no mess cake. It turned out perfect - moist inside and crisp on the top. The kids loved it. I made this cake it's was yummy... Cant wait to try other cakes...thanks for the good reciepe!!! hi there again! I just wonder if you have already tried baking a cake using dessicated coconut? Hi sofie13, no, I have not baked a cake with desiccated coconut. Love this cake, and so did everyone who tried it when we went to friends for dinner. Thanks for sharing this recipe. I tried your recipe and it was perfect. Didn't have any issues of burning my cake. I later tried the same adding cocoa and coffee and i've held to this recipe for a long time. I recently started blogging and today included the recipe in my blog linking back to your recipe. Also I heard about Linda from here and have fallen in love with her cakes. Followed this to the letter today and it was a huge success with everyone :) Thanks for a fab recipe! hi there, that cake looks perfect!!! did u fan bake at 180C??? Hi, I baked without fan at 180degC. Tried it in a more classic way to avoid failure, beat butter, 90 g sugar & eggs together first and add the dry ingredients later. Fast in easy! Mixed the ground almond with some rolled oats to make it 90 g for I did not have enough ground almond in my kitchen. I used whole grain spelt flour to replace the normal wheat flour for a healthier treat. Thanks for the delicious and easy recipe to bake for Christmas tea. Very useful post thank you! I made this cake however it was in the oven for a good 1 hr 20 mins and still appeared a bit undercooked! :( The taste was great though. I baked this cake last night and everyone loved it. It's so moist and yummy. Will definitely keep the recipe and bake it again when in the mood. Hi I baked this cake and the recipe was easy to follow but it smelt of egg whilst baking. Is this normal? Hi, my cake smells of vanilla and has a nice buttery fragrance while baking in the oven, I am not too sure what you meant by the egg smell? Made this cake today after bookmarking it almost a year ago!!!! Came out FAB....thanks HHB for al ur valuable tips :) I think the best way to avoid uncooked/dense cake is to follow the classic beat sugar+butter and then add eggs method (like someone mentioned earlier). Mine was absolutely soft, buttery and almondy!! I baked this for my husband's birthday yesterday. Thanks for sharing this simple, easy and yet delicious cake! Hi emma's mummy, glad to hear that your cake turned out great! and happy belated birthday to your hubby! Excellent recipe. This recipe is a keeper.. The only difference is that i creamed the butter with sugar before adding the egg.. and you can cut the sugar down to 100g as 120g was still too sweet for my liking. this was a gorgeous and delicious cake! i was shocked at how moist and fluffy it was. always looking for baking recipes with lower amounts of wheat flour and sugar. thanks for the recipe! Firstly i cut down sugar to 120g and it was fabulous! Thanks for this delicious and simple recipe. I made this for a beach picnic and it was super moist and dense. I found it a little eggy though. Could this be attempted with fewer eggs? I tried this recipe and was very disappointed. .it didn't rise very buttery and was not how I expected. Hi, sorry to hear that this recipe didnt work for you. Hope you have better luck with other recipes, cheers! I just made this yesterday, and was very happy with how it turned out. I didn't have sliced almonds, so I topped it with a bit of diced candied ginger and coconut flakes, and it was great. Thanks so much for the recipe! Can almonds be substituted for another nut? Like hazelnuts for a different flavor profile? Neelam, I have not tried it. Should be fine. can you put apricots on top like an upside down apricot cake? looks delish. Hi, I can't comment as I have not tried topping with fruits or apricots. Hi I'm thinking of trying this recipe. Would be alright to place raspberries on top, pressing slightly into the batter before baking? Thanks! Hi clarousel, I am sorry I have not tried baking with raspberries so I am not able to comment on this. Hi, I tried this without the flaked almonds on top and without the sugar dusting and it tasted amazing, thank you! I made this cake & it turned out perfect. I added 100 gms flour instead of 40 gms flour. We all loved this recipe . here is the link where I have posted in my blog. 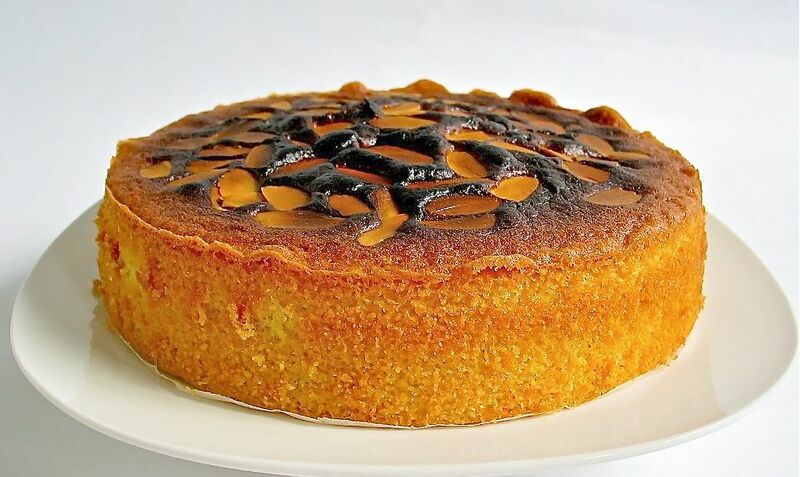 I have made this twice now and its delicious, best almond cake I ve tasted, lovely buttery and almondy, thanks for the receipe. Hi, this is a lovely cake. I have baked this many times for our self or when have guest. Its a winner every time. It has a beautiful texture and tast. And smells heavenly. Thanks for sharing this easy and love recipe. Hi, thanks for sharing this simple and tasty cake. May I know your left over slice will be kept in refrigerator or air tight container in room temperature ? Lovely cake and so easy to make. To really boost the almond flavour, I always add 1 teaspoon of almond essence [pure almond essence, not chemical rubbish] to the mixture. It boosts the almond flavour to a wonderous level. 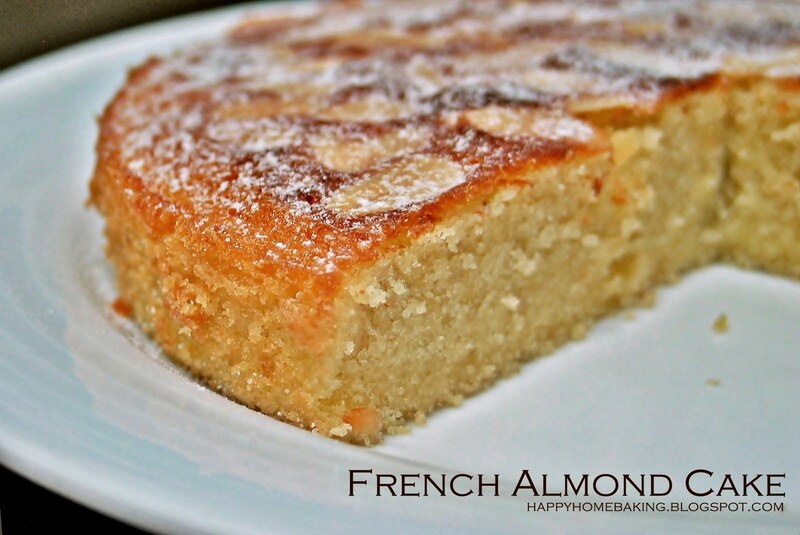 Hi, thanks for sharing your baking experience, what a great idea to enhance the flavour further with almond essence! Hello--I just tried this recipe, doubling it so I can make a two-layer cake. Unfortunately, it didn't rise very much--I used 9-inch pans, but even then, I expected the layers to be at least an inch tall, but they're far less. I think the problem might be with not beating the batter enough. The recipe says to beat the batter until it's light and fluffy, but how light and fluffy should it be? It was lighter and fluffier than regular cake batter, but I wasn't sure if I should go on. I know every person will have to beat their batter for different lengths of time, but for reference, can you tell us how long you beat your batter? And should the texture be like whipped cream or angel food cake batter, or is if all right if it's heavier? I haven't taken the cakes out of the pans yet, but I almost don't want to because I'm afraid I wasted all those ingredients. I wish I'd read comments before I tried the recipe. Hi Julie, sorry to hear that the cake didn't turn out well. This cake will not rise much, the finished batter should be similar to a butter cake, thick and spoonable. You can use the classic way of making a butter cake to prepare the batter, ie cream the butter and sugar and then add the eggs one at a time, followed by the milk and vanilla extract, then add in the flour and ground almonds. Hello--the finished cake tasted very good, but I baked an additional almond cake from a standby recipe so my finished cake would be tall enough. My batter was similar to butter cake batter. I'm not sure what happened. Maybe just a little longer in the mixer, and it would've worked out. I also might have let my butter get too warm so it couldn't aerate properly when I mixed the batter. It was over 100 degrees outside the day I made this cake. I see, hope you get better results next time when the weather is cooler. cheers! I am very interested to make this cake but I only have a tiny toaster oven which could fit in a 9" loaf pan. Can I use this mould instead for this cake? Will it be too high? Hi, you may bake it using the loaf pan, however, your toaster oven may cook the exterior faster than the inside as toaster ovens tend to heat up much faster. As such the centre of your cake maybe under baked while the exterior may turn dry and hard. Ive made this cake twice with your recipe both was delicious now my 2nd most favourite cake. Instead of almond powder I used almond essence. Still beautiful and soft. Thanks for sharing. Hi HBB, I just discovered your page, as I started looking for an almond cake recipe. It's very interesting to read all the comments. I can't wait to try it out myself. Just one little question- I'm thinking of baking this batter in mini cupcake cases...obviously suitably reducing the baking time. What do you think? Any suggestions? Thanks for sharing the recipe. Hi, I have not tried baking this using in cupcake form. I guess there shouldnt be a problem, it would probably takes about 10-15mins to bake. Hi Komal, you can give it a try but you would need to extend the baking time. I've just made this cake from your recipe and it's very wet and eggy. It took twice as long as suggested to cook. I've googled and found this version, which clais to be fromt he same source, and most of the quantities are different. Anyone struggling to make this recipe work should bear this in mind! Hi Raynah, sorry to hear that your cake didn't turn out well. Hope you have better experience with the other recipe. Hi, love almond cakes so gave it a go today but mine didn't rise really so was pretty flat - although it tasted good! Any clues on what I did wrong? Hi Anon, this cake won't rise too much. But did you happen to use a bigger pan?